The Color Your Day with Radiance Bouquet by FTD blooms with bold beauty and unforgettable color to give your special recipient a gift that reflects their own shining personality and charm. 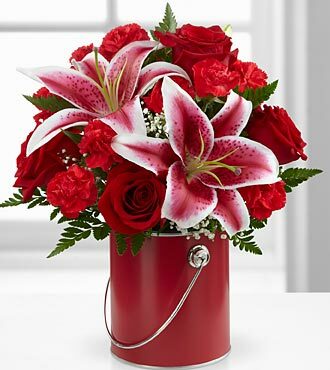 Rich red roses, eye-catching Stargazer Lilies, bright red mini carnations, million star gypsophilia and lush greens are artfully arranged within a striking red quart size decorative paint can inspired vase to create an incredible gift they won't soon forget. STANDARD bouquet is approximately 11H x 11W. DELUXE bouquet is approximately 12H x 12W. PREMIUM bouquet is approximately 13H x 13W. "She loved the flowers, great service!" -- Marty P.